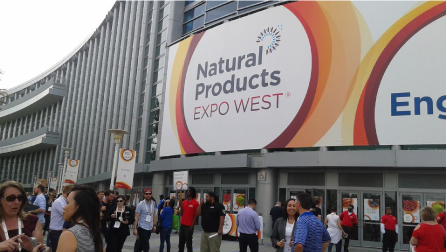 One of our favorite things to do each year is attend the Natural Products EXPO West. There we get to experience and learn about hundreds of new brands that are entering the market. We always come away inspired by the drive and commitment of founders and health nuts that are committed to creating the next best healthy product. Here are some of our favorites from 2017. 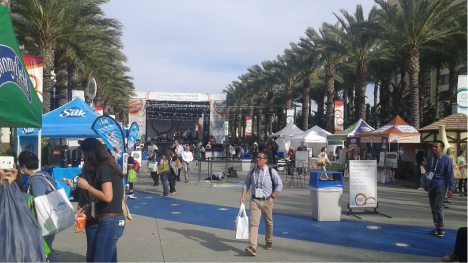 The 2017 Natural Products Expo featured over 3,100 exhibitors spread throughout an event space that filled up the Anaheim Convention Center, and flowed into fully packed exhibits in the adjacent Hilton and Marriott Hotels. People flew in from all over the world to see what the brands leading the natural foods revolution are doing next. The product is the cause. 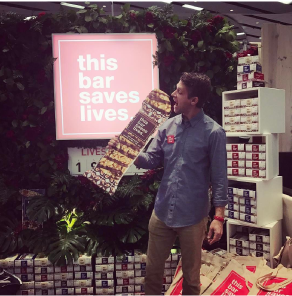 This yummy, chewy and crispy granola bar coated with ready to melt chocolate underneath is called “This Bar Saves Lives”. Immediately, you’re left wanting to know how it saves lives. The product is not only delicious, with flavors that jump out at you in every bite, but it also clearly and prominently communicates its cause above everything else. It’s in the name, in the booth’s lit-up sign, and right underneath the big red sign there, is a counter of how many lives the bar has helped save. Every bar helps provide a meal packet for a hunger-stricken child. This is what we mean when we say the best cause marketing is inseparably and authentically tied to the brand. It created credibility on one hand, but more importantly, it makes way for real impact in real humanitarian issues. This bottled water company delivers clean, natural spring water, but their cause is much bigger as they tackle on many issues with their single earth friendly product. 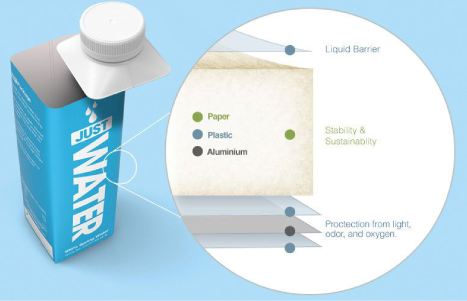 The bottle is made from 82% renewable sources: paper and sugarcane derived plastic. Their water is sustainably collected from excess water from a watershed in Glen Falls, NY, providing all natural spring water. So what the cause? Providing sustainably gathered water in eco friendly materials is already a huge step above most bottled water brands, but the cause is much bigger than that. By partnering up with the City of Glen Falls, Just Water sources their excess water and in turn, pays 6x the rate of municipal water rates. They pay more for water so it helps the city rebuild their water infrastructure and fund other city projects, but Just Water’s water is only gathered from their watershed’s excess water. Just Water is and pay more for water while still keeping costs to the end consumer low. The idea is that because we treat water as an endless resource, the water commercialization model should change to source, sell and use water more responsibly, in hopes to hoping to “redesign the model for valuing water responsibly”. Pay more for water because it should be valued more, cut inefficient and unsustainable business and environmental practices. This is made possible by efficient and sustainable practices that keep other expenses such as energy and running costs low for the company. By paying Glen Falls more for access to their water, there is more money for municipal water infrastructure repairs. Our water supplies aren’t endless and Just Water made it its mission to sell water in a way that’s fair to our planet and the consumer. 51FIFTY Energy Drink gives you a caffeine kick without the sugary aftertaste. Made with a mix of natural herb extracts and other health conscious ingredients, it’s formulated to give you energy and support vitality. Right away, the brand gives off a vibe full of life and energy. Although it wasn’t branded on their EXPO display, a conversation with the team at the booth explained the brand’s commitment to helping families who live with autism. The beverage brand’s website has several web pages dedicated to informing viewers of The Race For Autism and their partnership with the Carlos Vieira Foundation, earning credibility through their deep commitment to the cause. 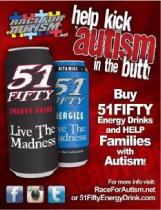 51FIFTY holds multiple fundraisers a year, donates a percentage of every sale to autism organizations and has consistently carried out campaigns over the years to increase autism awareness. It’s more important than ever to deliver products that are Good-for-You and also get some Good done for the world as it becomes a key factor in how Millennials shop.